AWS compliance solutions help streamline, automate, and implement secure baselines in AWS—from initial design to operational security readiness. They incorporate the expertise of AWS solutions architects, security, and compliance personnel to help you build a secure and reliable architecture easily through automation. This Quick Start includes AWS CloudFormation templates, which can be integrated with AWS Service Catalog, to automate building a baseline architecture that fits within your organization's larger HIPAA compliance program. It also includes a security controls reference, which maps HIPAA regulatory requirements to architecture decisions, features, and configuration of the baseline. Deploying this Quick Start builds a multi-tier, Linux-based web application in the AWS Cloud. Figures 2 and 3 illustrate the architecture. You can also download these diagrams in Microsoft PowerPoint format, and edit the icons to reflect your specific workload. AWS CloudTrail – AWS CloudTrail records AWS API calls and delivers log files that include caller identity, time, source IP address, request parameters, and response elements. The call history and details provided by CloudTrail enable security analysis, resource change tracking, and compliance auditing. Amazon CloudWatch – Amazon CloudWatch is a monitoring service for AWS Cloud resources and the applications you run on AWS. You can use CloudWatch to collect and track metrics, collect and monitor log files, set alarms, and automatically react to changes in your AWS resources. 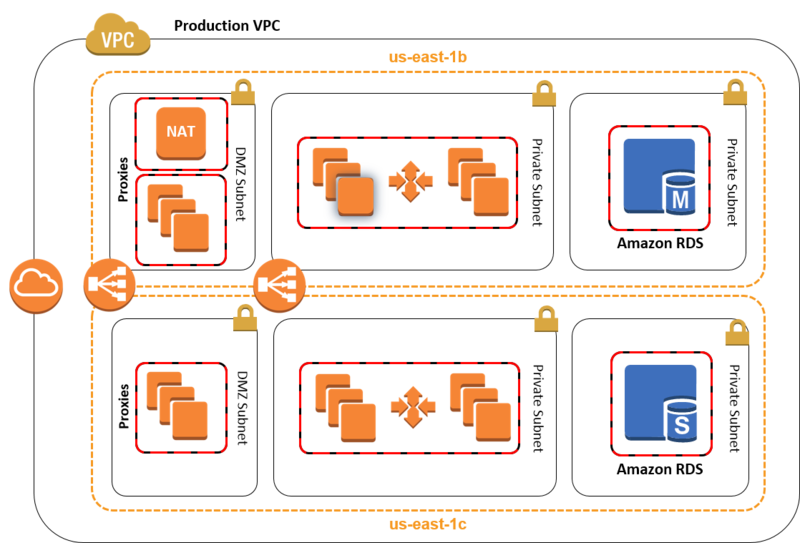 AWS Config – AWS Config is a fully managed service that provides you with an AWS resource inventory, configuration history, and configuration change notifications to enable security and governance. AWS Config rules enable you to automatically check the configuration of AWS resources recorded by AWS Config. The AWS Config rules feature is currently available in the AWS Regions listed on the AWS Regions and Endpoints webpage. Elastic Load Balancing – Elastic Load Balancing automatically distributes traffic across multiple EC2 instances, to help achieve better fault tolerance and availability. Amazon S3 Glacier – Amazon S3 Glacier is a storage service for archiving and long-term backup of infrequently used data. It provides secure, durable, and extremely low-cost storage, supports data transfer over SSL, and automatically encrypts data at rest. With Glacier, you can store your data for months, years, or even decades at a very low cost. Amazon RDS – Amazon Relational Database Service (Amazon RDS) enables you to set up, operate, and scale a relational database in the AWS Cloud. It also handles many database management tasks, such as database backups, software patching, automatic failure detection, and recovery, for database products such as MySQL, MariaDB, PostgreSQL, Oracle, Microsoft SQL Server, and Amazon Aurora. This Quick Start includes a MySQL database by default. 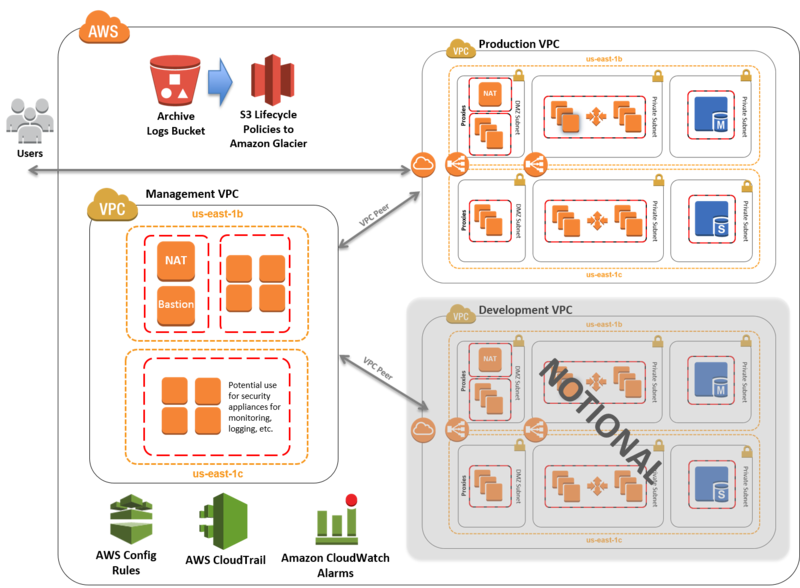 Amazon VPC – The Amazon Virtual Private Cloud (Amazon VPC) service lets you provision a private, logically isolated section of the AWS Cloud where you can launch AWS services and other resources in a virtual network that you define. You have complete control over your virtual networking environment, including selection of your own IP address range, creation of subnets, and configuration of route tables and network gateways. You must process, store, and transmit protected health information (PHI) using only HIPAA Eligible Services, as defined in the AWS BAA. The most current list of HIPAA Eligible Services can be found at https://aws.amazon.com/compliance/hipaa-eligible-services-reference/. You may use the full range of AWS services with non-PHI data, even in a HIPAA Account under the AWS BAA. You can use this Quick Start to build an environment that serves as an example for learning, as a prototyping environment, or as a baseline for customization. Since AWS provides a very mature set of configuration options (and new services are being released all the time), this Quick Start provides security templates that you can use for your own environment. These security templates (in the form of AWS CloudFormation templates) provide a comprehensive rule set that can be systematically enforced. You can use these templates as a starting point and customize them to match your specific use cases. The AWS CloudFormation template for this Quick Start includes configuration parameters that you can customize. Some of these settings will affect the cost of deployment. For cost estimates, see the pricing pages for each AWS service you will be using. Prices are subject to change.